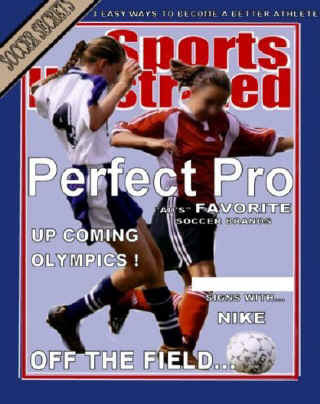 You need to design a magazine cover using Adobe PhotoShop Elements (Available at the Amazon Adobe page ). Your magazine cover can be based off of an existing magazine, for example use the layout and name of Teen magazine, but design your own photos, titles and story lines, or create your own magazine totally from scratch, around an interest you have. For example, create a magazine based on Rats, Shopping, a Boy/Girls Life in Middle School, or Fossils, etc. Your magazine cover will be graded on if you included the above elements and how you carry out Unity in your magazine cover. _____Unity can be achieved by carrying out a common theme in the type styles, photos, story titles and descriptions. Do all the parts work together? _____Think about readability, can you read the type against the background? Is the type style readable? Are the sentences too long? Are the titles descriptive enough to make you know what the article is about? Does the type size signify the importance? _____Does the photo or photos support the theme? Does the photo catch your eye? Is it too busy or too simple? _____How is your effort and craftsmanship? You will need to be selecting, cutting, pasting and cropping. Does your cover look professionally neat? _____Layout, how did you arrange all the elements? Is the type all lined up flush left, right, centered? Is the type over the picture or a background? Did you add a banner with the issue date, web site, and cost? Does the layout make it easy to read or confusing? 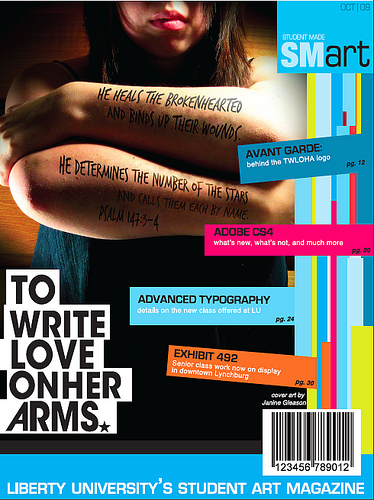 Below left: Magazine design by Janine Gleason of Liberty University. (from Judy) I couldn't find any direct links for magazine layout design - but did find these lesson plans that might be helpful. I found LOTS of interesting magazine covers though (they will come up when you do a search). Here is some vocabulary for you: masthead (title), typesetting/typography, layout, nameplate/logo, bleed (illustration goes edge to edge). Layout Workbook: A Real-World Guide to Building Pages in Graphic Design - The book illuminates the broad category of layout, communicating specifically what it takes to design with excellence. It also addresses the how and why of the creative process. The 10 Influential Creators for Magazine Design - What is magazine design? What are magazine designers and art directors thinking, and in which directions are they heading? Armed with those simple questions, the author visited ten prominent magazine art directors who have been influential in the world of magazine design. Designing Magazines - How does a designer create graphic solutions to the behind-the-scenes editorial challenges at a magazine? Designing Magazines is the complete guide to understanding the inner workings of magazines and their day-to-day management--and a great guide to using that knowledge to create visually stunning, editorially effective magazines.